Clinical trials are a series of studies progressing from small pilots to large-scale trials, which evaluate and compare new medications, combinations of medications, procedures and medical devices and generate information on how safe and effective they would be in practice. Satisfactory results of clinical trials are required by both national and European regulatory agencies before the products or procedures can be granted market authorisation and all the conditions of use agreed. The trials are carried out according to strict procedures (protocols) which have been approved by an independent research ethics committee to protect the interests of people taking part. Before a new medication can enter the market and be available to patients, its safety and efficacy must be tested throughout the phases outlined below. Volunteer patients can take part in the trials of new medications, provided they meet the specific conditions of the individual trial, which may include the current state of their myeloma, recent treatments and their outcome, age, other health conditions etc. Many people with myeloma are keen to participate in trials, because as well as giving access to new treatments before they are widely available, taking part will guarantee a high level of monitoring from the clinical staff running the trial. Clinical trials are usually carried out in hospitals, and often take many months or years to collect all the results. They could be funded by a public sector research body, a private foundation (e.g. the International Myeloma Foundation) or research- funding organisation (e.g. the Multiple Myeloma Research Foundation or the European Myeloma Network), or by a pharmaceutical company. In the later phases, trials are often carried out simultaneously at a number of different study locations – which gives patients an increased chance to take part. Clinical trials in the EU are regulated by the requirements of the EU clinical trials regulation, which is designed to ensure that no harm comes to the participants in trials and that the outcomes are scientifically validated. The regulation replaced earlier EU requirements which had to be implemented by national legislation; often leading to different interpretations in the different countries. The intention of the clinical trials regulation was to encourage more clinical trials to be conducted in Europe by reducing the differences between the regulatory requirements of different countries. Phase I studies are usually small, involving less than 50 patients and are focused on safety. They aim to identify the best route of administration, identify any side effects and identify the best dose to avoid or minimise the unwanted effects. Phase II trials will be conducted on products or treatment which have already successfully completed Phase I, and typically involve up to 300 patients. Larger numbers are needed to make sure that the result is statistically reliable, as different people may respond in different ways to the same treatment, due to their individual genomics. Phase II concentrates on establishing efficacy – whether the product or treatment works, using the dose and route established in Phase I. Products which are already in use, but are being tested in a new combination or approach, will start with Phase II. For medications which are intended to treat myeloma, researchers will need to evaluate whether the myeloma responds to treatment, whether and by how much the periods of remission can be extended, whether and by how much survival can be prolonged, and whether there is improvement in general quality of life. All these parameters will be compared with the benefit gained from existing treatment, as the overall aim is to find out if the new product or treatment is better than treatments that are already available. Phase III trials will follow, if a critical proportion of patients show improved benefit from the new treatment compared to existing treatments, and if the side effects are tolerable. 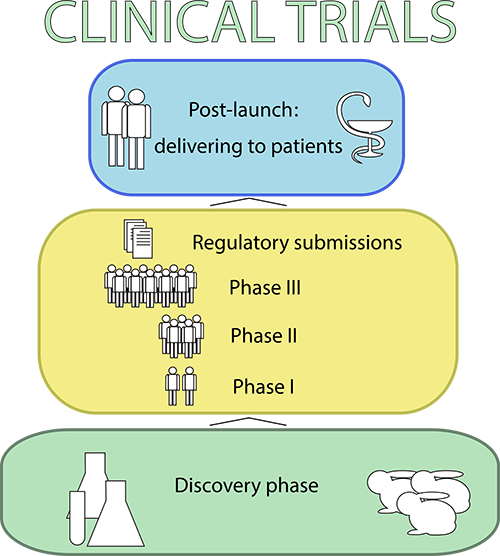 Phase III trials can often involve several thousand patients, and they aim to confirm the safety and effectiveness of the new treatment, in comparison to that of ‘control’ patients given the existing (standard) treatment. Allocation of patients to either the new treatment or the control group is randomised, and if possible the study is ‘blinded’ so that the patient does not know which group he or she is in, or ‘double-blinded’ so that neither the patient nor the doctor knows. These precautions help to avoid any natural inclination in either to misinterpret the results. The protocol for every clinical trial defines its exact purpose, so the researchers have to be sure that the participants meet clear criteria so that the trial results concern only what is being tested and could not be explained by some variation between the participants. The criteria for taking part in a specific trial are known as inclusion criteria. They commonly include age, gender, whether the myeloma is newly diagnosed or relapsed, what treatment has already been given and whether there are other significant medical conditions. Before taking part in a clinical trial, you will be asked to sign a form giving your informed consent. This means having a complete understanding of the purpose of the study, the treatments and tests involved, and possible benefits or risks. While many patients are keen to try a new treatment, others might be more concerned about whether it was any better than what they already have, or about new side-effects. Giving informed consent means that you have weighed up all these factors and decided to continue.